After visiting the chiropractor we ended up back at Buena Vista Beach Resort, Los Barriles where we stayed last fall. But as you know there is always an adventure along the way. Disclaimer: I don’t want anyone reading about this trip to think that I’m in any way putting down or criticizing Mexico or its people. This writing is about two naive Canadians, with no knowledge of the Mexican culture, zero Spanish and no charade skills trying to make their way through an unknown maze. Now… back to the plot. Thinking back to last night’s hotel I think some of the problems might have been caused by paying cash as when you do that, there is no paperwork. The cash goes under the counter never to be seen again and who knows… maybe we got a room that was off the books. On the other hand, you get a much lower rate when you pay cash. Like in Todos Santos they wanted $245 USD for the room and when Rob explained he wouldn’t pay that but he would pay with cash they dropped the price to $100 USD or 2000 pesos. We packed up this morning and went to have breakfast. The egg dish looked a little sketchy so with a piece of toast each we were out the door. But not before one last tip was in the making. I was already done in the car with all the bags and Rob went up for one more trip of the cooler and topper (foamy for the bed). The next thing I know someone was coming down the stairs with the stuff but it wasn’t Rob. One of the porters saw him making his escape and grabbed the cooler and topper and proceeded him down the stairs. Too funny. You have to admire their persistence. Puttering our way out to Los Barriles we went into a few towns that had spared no expense on infrastructure. Sidewalks, streetlights from the main road into town and large turnarounds and plazas. On the other hand, the houses had seen better days but were well kept and the streets were being raked clean by local community workers. What amazes me it the little stores or coffee shops in the towns. They are about 8×8 ft or maybe 10×10 but no bigger. The chairs are in the doorway and out front on the sidewalk and there is at least a couple of people enjoying their coffee, relaxing and talking. Dogs and chickens abound and we even passed a walled residence with the name “Casa Canadian” along with a Canadian flag. 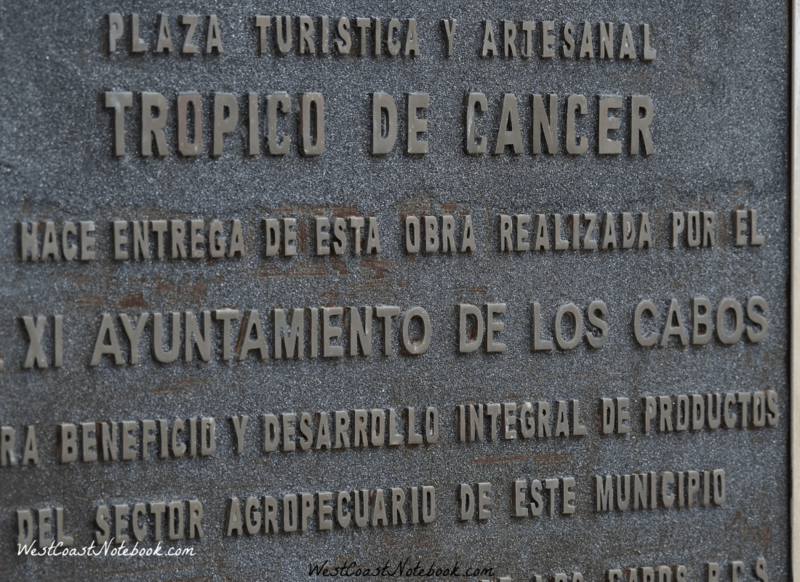 Heading back down the road we came to the Tropic of Cancer. 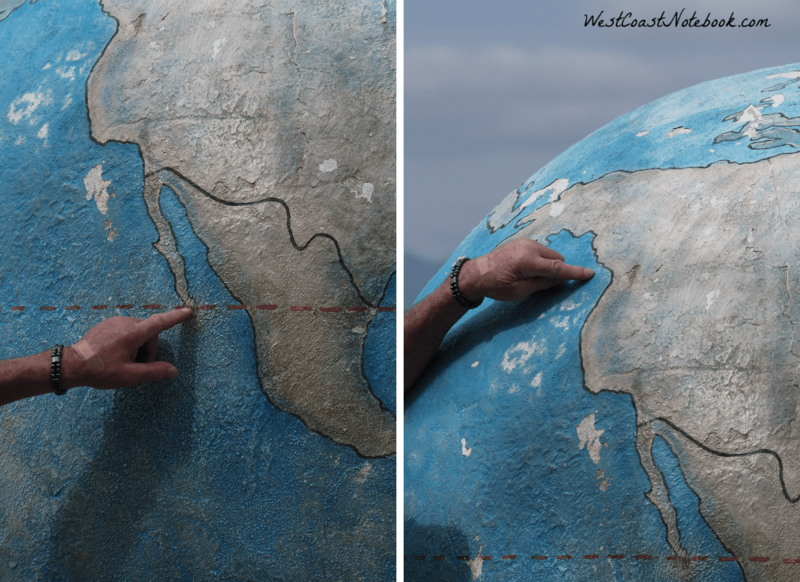 There was a rest area with a large globe, arts and crafts and a demi church. 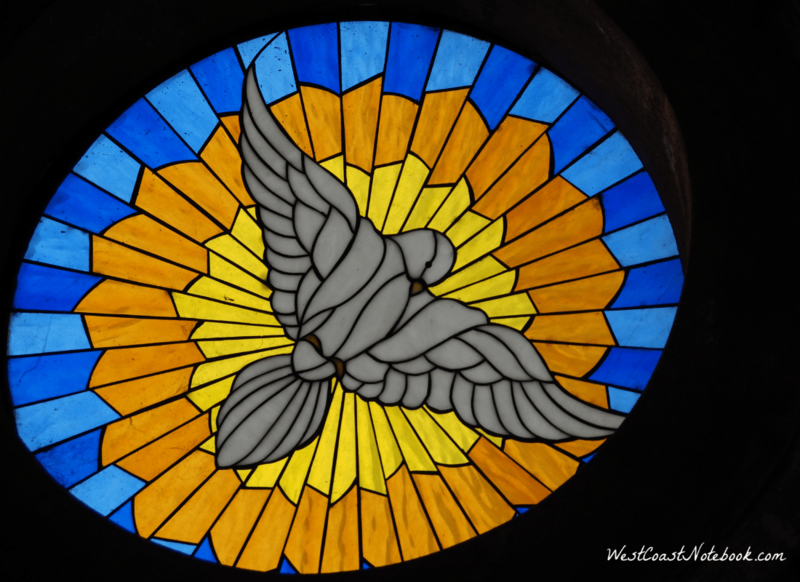 I say “demi” as there were only the pews and alters with a wonderful domed ceiling but the rest was open to the winds. The next stops was when I yelled: “STOP! 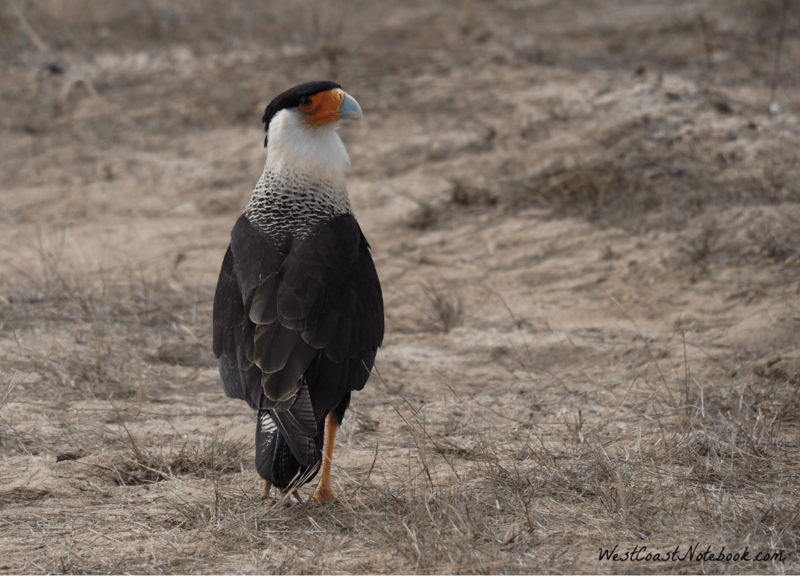 !” for 2 Caracaras. Rob slammed on the brakes then noticed there was a car right behind us and we headed for the verge. Great excitement as we bumped through a hole in the fence just wide enough for a car to fit and I got my shots. Another one of the roads led to a little town called La Ribera. A lot of people who work in the resorts around here live in the town and it was the first place where we saw an actual real RV park and there were crosswalks all through town. Back on the main highway, there was a sign that said “Rancho Leonero” 8 km. The drive in was fun as it was a dirt and sand road but in a lot of places, there were large banks on either side like they had cut the road through a hill. It was like going down a bobsled run with all the curves banked the right way and Rob drove it like a professional bobsledder. At the end was this lovely resort and it looked like some of the rooms were just being built. In fact… the resort was closed for three months and would reopen in March. The only thing that was open was the bar. It was a really nice layout and if it hadn’t been closed we would have stayed. Large rooms, lots of space and a great beach for fishing and hiking. By this time the wind had picked up but putting on some sunscreen we headed down the beach. 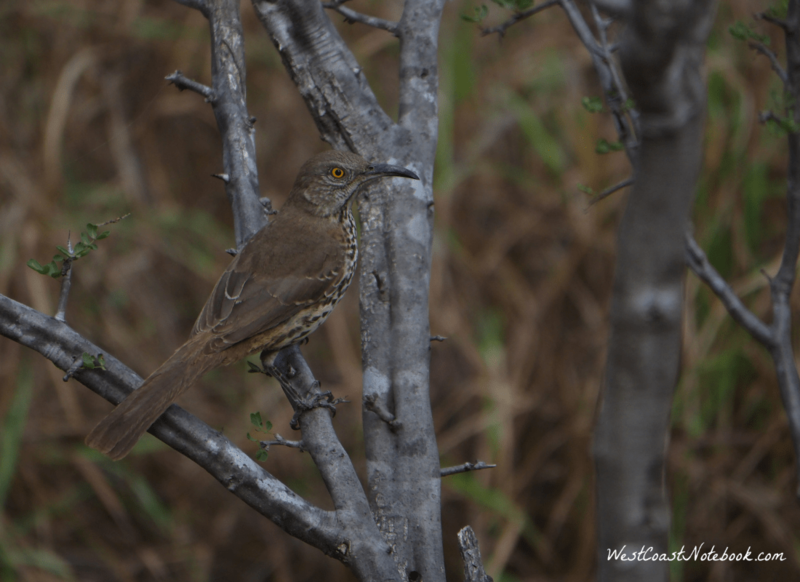 I would have been quite happy there as there was a large marsh beside the resort and you could see lots of bird and small animal tracks. Rob found a pufferfish all puffed up gasping for air on the beach and spent the next 10 minutes trying to get it back through the swells to calmer water without getting pricked by the spines. The endeavour was unsuccessful, as much as he tried to assist it. Heading back out you would have thought that they would have put a sign up at the main road saying that the resort was closed, but maybe they don’t do drop-ins and weren’t expecting anyone. On the other hand, we would have missed the fun drive down the bobsled run. By this time it was around 2:30 and the only thing we had eaten was one piece of toast for breakfast, chips and a couple of Oreos. Food was front most and center on our minds. Los Barriles was the next stop and we went to a place we had eaten before only to find them taking the tablecloths off the tables and closing for the day. We checked out a few more restaurants and it appeared we were in the witching hour. Too late for lunch and too early for dinner. Found a smoothie place and that was lunch. 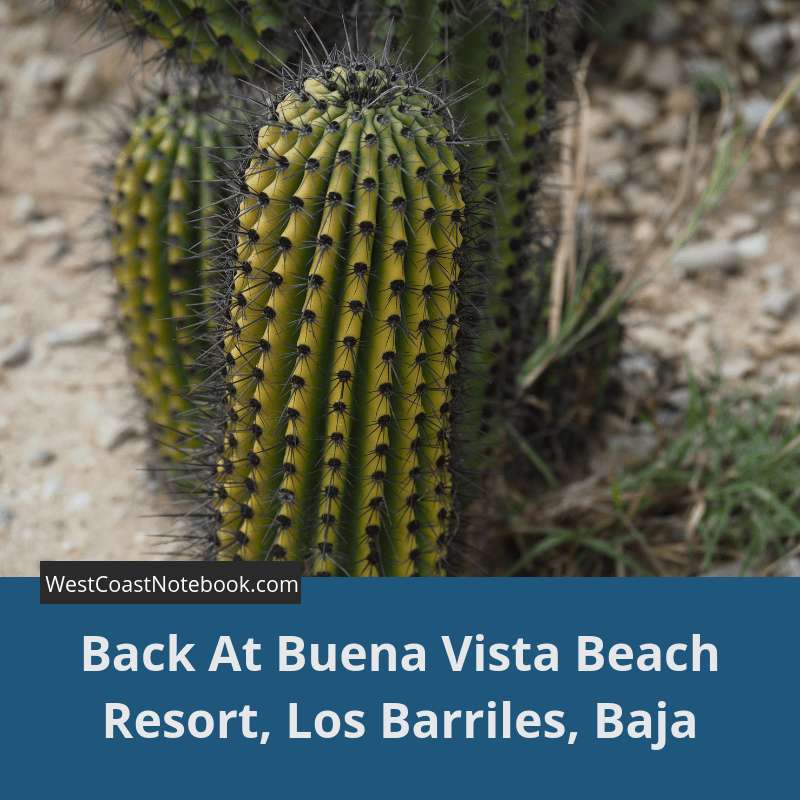 Instead of heading up to La Paz we decided to stay at the Buena Vista Beach Resort where the rooms were neat and clean, hot springs and excellent food. So we will be here for a few days. Wind is howling but we went for a walk on the beach anyway. I swear our glasses got sandblasted. It was almost hard to stand up into the wind it was blowing that hard. Hot springs next then a dinner of ribs. Sooooo gooood! Will catch you up tomorrow.